Producida por Nu Boyana Film Studios, SC Films International, Millennium Films, Nu Image Films, Saturn Films, Simon West Productions, Wonderland Sound and Vision. Distribuida en España por Aurum. 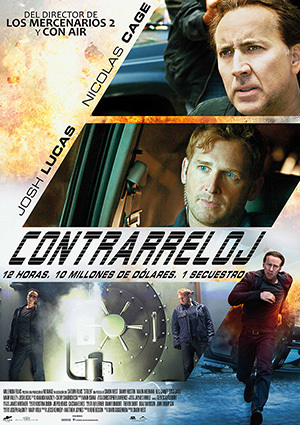 Imágenes, tráiler, cartel y sinopsis de "Contrarreloj" propiedad de la distribuidora (Aurum) y de la productora cinematográfica (Nu Boyana Film Studios, SC Films International, Millennium Films, Nu Image Films, Saturn Films, Simon West Productions, Wonderland Sound and Vision).